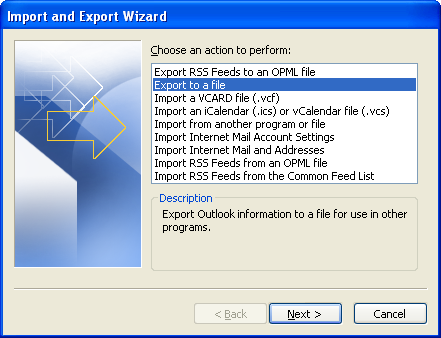 Information in MS Outlook can be exported to Personal Folders file (.pst) with help of Import and Export Wizard. This brings a way to transfer items of Outlook to another computer or to create a backup. Folders properties such as views and permissions are not conserve when you export to an Outlook data file (pst). Only content itself is exported. 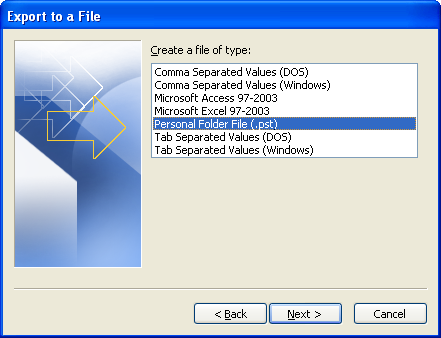 Steps to export data are mentioned below. Go to the "File" menu, click on "Import and Export" option. After that click on "Export to a file option" and then "Next". 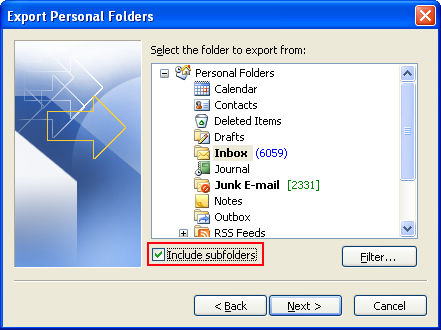 Select "Personal Folder File (.pst)" and then click on "Next" button to proceed further. Now select the account – a top level folder – that you desire to export. This enables exporting "emails, contacts, calendars, notes and tasks" if available for that "Outlook account". Note: You can export only one account information at a time. Make sure to select the Include subfolders check box. Then click on "browse" button to select the location where you want to save Personal folders file (.pst) and to "enter a name of file". If you are exporting data to an existing Personal Folders file (.pst), under Options, clarify what to do when exporting items that are previously exist in file.